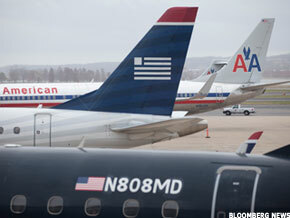 US Airways has aggressively sought union backing for its bid to take over AMR, and is getting results. The original version of this story was revised to reflect that the Allied Pilots Association was one of the three unions that backed the US Airways bid for AMR. CHARLOTTE, N.C. ( TheStreet) -- US Airways ( LCC has been successfully gathering union support for its effort to merge with bankrupt AMR ( AMMRQ.PK, and could unveil a union-backed bid as early as next week. The carrier has managed to win qualified backing from the three key American unions -- the Transport Workers, the Association of Professional Flight Attendants and the Allied Pilots Association, according to people with knowledge of those discussions. The carrier's executives have also been presenting their case on Capitol Hill, "making promises to reverse job reductions at American," said a person who was informed of those discussions. "The unions are all working together," said a person familiar with the overall agreement. "They are open to a merger, not circling the wagons against one." The Dallas Morning News reported last week that US Airways CEO Doug Parker and President Scott Kirby "supposedly holed up a couple of hours with the Allied Pilots Association board of directors and national officers at the union's headquarters near Dallas/Fort Worth International Airport." For its part, AMR is focused on the bankruptcy process and the hearings that begin next week on its request to terminate its labor contracts, said spokesman Bruce Hicks. "We are in the midst of a complex restructuring, intensely focused on successfully reorganizing to restore American to industry leadership, profitability and growth," Hicks said. "Achieving that goal will position American to chart the very best path forward for all of its stakeholders." US Airways declined to comment.